"Abundant Life to All": The Y.W.C.A. of the U.S.A. : an online exhibit from the Sophia Smith Collection. 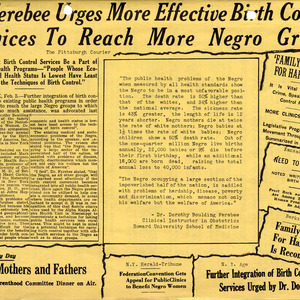 Online exhibit features images, records, and manuscripts from the historical records of the YWCA of the U.S.A. which are housed in the Sophia Smith Collection. 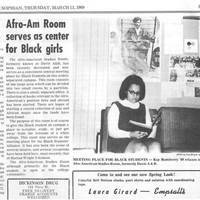 "Afro-Am Room serves as center for Black girls," The Sophian, 13 March 1969. 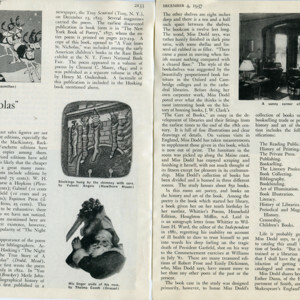 Newspaper article from Smith College student publication The Sophian with photograph of Kay Hansberry, Class of 1969. The Afro-American Studies Room was also the home of the Black Students Alliance in 1969. "Bringing In The Tree," from Three Christmas Drawings by EREJ. 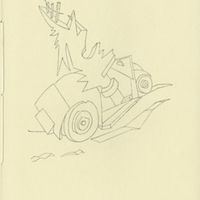 The second drawing in a monograph of three Christmas drawings done by Jere Abbott for Annetta Clark in 1936. Privately printed by the Ardwen Press, Madison, NJ, in a limited edition of 68 copies of which this is number 36. 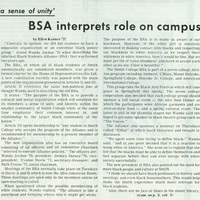 "BSA Interprets Role on Campus," The Sophian, 12 December 1968. 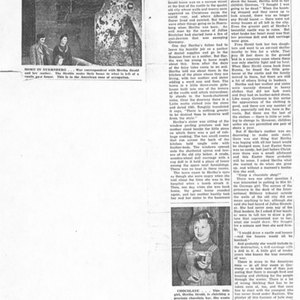 Newspaper article about the Black Students Alliance in the Smith College student newspaper The Sophian, dated 12 December 1968, and written by Ellen Kanner, Class of 1972. "Christmas Carols," from Three Christmas Drawings by EREJ. 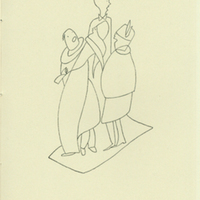 The third drawing in a monograph of three Christmas drawings done by Jere Abbott for Annetta Clark in 1936. Privately printed by the Ardwen Press, Madison, NJ, in a limited edition of 68 copies of which this is number 36. 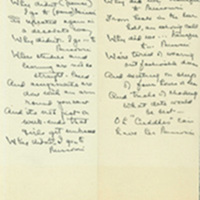 "From a library carrel I heard a girl say...," autograph manuscript in unidentified hand, undated. Student poem about working in a library carrel. Handwritten on a printed document titled "Final Declaration of Interest on Certificates of Contribution, The Provident Loan Society of New York, 346 Fourth Avenue, New York 10, N.Y."
"Girls Who Started in First Women's Intercollegiate Tournament," Boston Herald newspaper clipping, 25 June 1929. 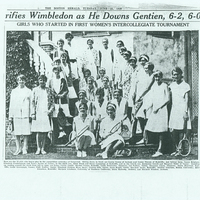 Photograph with caption including names of tennis players from Smith College who competed in the tournament.